“Then all the people went away to eat and drink, to send portions of food and to celebrate with great joy, because they now understood the words that had been made known to them” (Nehemiah 8:12). The 50 days of counting the omer began with the firstfruits of the barley harvest. If you want, buy some barley and put a kernel or two in a jar for each of the 50 days. 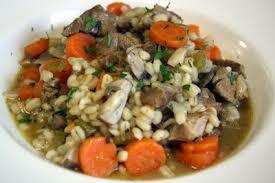 On Shavuot, use the collected barley along with some lamb and lentils to make this stew as a harvest offering. 1 cup Swiss cheese, grated. Directions: Cook the lentils and barley in water according to directions on the package or use a pressure cooker. Brown the lamb and then remove from the pan and put into a stew pot. Sauté celery, carrots, and onion in butter. When lentils and barley are cooked, drain and add the chicken broth with seasonings, the sautéed vegetables and the lamb. Simmer for ½ hour. Serve with Swiss cheese melted on top.